The city of Boston is a great place to find an eclectic and engaging dining experience. Home to some of the oldest restaurants in America–and some of the hippest new bars–, Boston has a diverse and incredible food scene for any palette and budget. From March 6-11 and 13-18, 2016, Boston will offer its hungry masses two weeks of good-eating. It’s called Dine Out Boston (formerly called Restaurant Week), an event organized by the city of Boston with the goal to make restaurant dining more economical for two mouth-watering weeks. Enjoy two or three course meals at some of Boston’s finest restaurants (Lunch $15/$20/$25, Dinner $28/$33/$38). While I encourage looking through all 169 restaurants participating, here are some of my recommendations. Note: You are strongly encouraged to make a reservation at the restaurant, whether by calling, booking through OpenTable, or using the Dine Out website. I Sea Food – Boston’s prime location (i.e. by the Atlantic Ocean) means that fresh seafood is always close and convenient, so don’t miss out! Italian outside the North – While the North End boasts some pretty impressive Italian fare, other exceptional Italian joints are scattered all over Boston. Je Suis Francais – French food has a strong showing this year, with many past and current winners of Best French Boston participating in Dine Out Boston. Something’s at Steak – Do you have a beef with someone? Resolve it at one of the many great steakhouses in Boston! Somewhere Beyond the Sea – Other countries exist besides Italy and France, I promise, and they have delicious offerings as well. ‘Murica has Food Too! – Why is it so hard to describe American food…? Nearby Dining – If you feel like leaving Harvard Square is too much of a chore, fear not! A number of restaurants nearby are participating. *One of the oldest restaurants in America with frequent visits from presidential candidates. I’m supposed to be working on my paper due tomorrow, but I turn on my phone and go on Facebook. As I scroll through my feed, the first thing I see is: 5 Make-Ahead Dinners That Will Make You A Champion At Life. Like all other freshmen, eating Annenberg food every day has become more than a little tiring. A small hope burgeons in my chest – maybe I’ll finally be able to eat something else? – and I click on the link. But I read the first line of the recipe – “Heat olive oil in a large saucepan or skillet” – and the sensation of crushing disappointment hits. Heat? As in fire? As in one-of-my-biggest-phobias-in-the-world? I love food. And I especially love good food. Alas, I can’t cook because 1. I’m deathly afraid of knives and fire, and 2. I gave up on the culinary arts after I caused a small fire while trying to make instant ramen. So recipes like 20 Fast Dinner Recipes or 27 Healthy Recipes You Can Make in Your Dorm Room are a bit…beyond my capabilities. Herein lies the problem: I love good food, but I can’t cook to save my life, and Annenberg food isn’t always fulfilling. Thankfully, my mom makes amazing food, so I survived my first 19 years of life. But unfortunately, sending over food from California even once a week, let alone every day, is a bit unrealistic. And eating takeout everyday is very tempting – if only I had a bottomless wallet. I thought about this long and hard before college started, and after hours of pondering, I finally came up with a solution: Join a food blog! Getting subsidized to eat awesome restaurant food as long as I write a review is an offer I absolutely cannot refuse. In nearby Somerville, the buzz and activity of Cambridge and Boston seemingly do not exist. Quaint is the only way to describe the rustic buildings and quiet space. A mere ten minute walk, and you are able to escape the infamous “Harvard Bubble.” If you need a reason to allow yourself to leave Harvard to Somerville, go to Bergamot. Bergamot is inconspicuous, sharing a building with a cable store and a kebab shop. It may not catch your attention immediately, but a glance inside the space reveals a sophistication that is unexpected. My dining companion and I had a reservation for two at 5:00 pm (opening time), and we were promptly seated. Our waitress greeted us and informed us of our options. The two most popular offerings are the $44 dinner prix fixe, composed of an appetizer, entrée, and dessert of your choice, and the $75 tasting menu, a creative sampling of the chef’s choice. Given our time restriction, we opted for the $44 prix fixe (menu items can also be selected à la carte). After some careful deliberation, we ordered our appetizers and entrees and waited patiently. The customary bread and butter were delivered and were pleasantly surprising. The unique apple mustard butter paired excellently with an almost burnt crust and custardy crumb. My appetite was stimulated. I excitedly watched as plates of food began exiting the kitchen. As my plate was placed in front of me, I could barely hold myself back out of courtesy for my companion. The instant both plates touched down, we ravenously began to eat. The jet black squid ink tagliatelle left an immediate visual impact: a contrast of colors with a white plate and brightly colored heirloom tomatoes. The pasta itself was cooked a nice al dente, which gave it an almost meaty characteristic that complemented the sweet juiciness of the tomatoes. The light saltiness of the pecorino cheese plays on the palette like a light ocean breeze. My appetite slightly sated, I tasted the sea bass crudo and was confused by the complex saltiness from the avocado dressing, the floral notes from the petals, and the sweetness from the two types of melon. While these flavors bounced around my mouth, I was slightly off-put by the amalgamation of flavors. I could see the inventiveness in the exploration of taste, site and smell, but this particular dish was not appealing. We finished our courses and waited for the entrees. As our waitress deposited the plates in front of us, I sat in awe of the meticulous plating of each course. I started with my course, the scallops provencal. My knife sunk through the scallop like a warm butter. The scallop simply melted in my mouth but simultaneously retained the meatiness of a protein. In a state of sheer bliss, I was amazed by the sweet scallop with minor notes from the tomato sauce and dill. 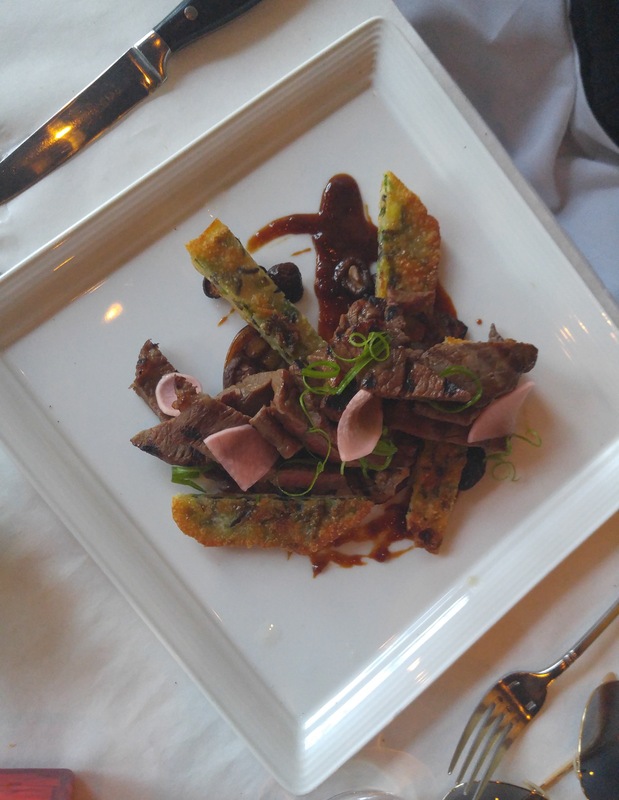 The green beans served as the necessary textural component to give the dish a crisp element. Enjoying my course, I sampled my friend’s dish, and experienced an entirely different sensation. In contrast to my dainty scallops, I was almost overwhelmed by the rich meaty short ribs. The slightly sweet Korean glaze was apparent, and it balanced the plate with the crisp salty wild rice pancake. Nothing could describe this course besides a masterful expression of umami (savory flavor). Fairytale eggplant and shiitake mushrooms only contributed more to the savory nature of the course. As our meal wound down, we prepared for our dessert courses. To say the least, I was underwhelmed. My peach ice cream was a nice reminder of the end of summer, but the ice cream was slightly icy and detracted from the overall dish. The tres leches was also unimpressive, so we finished our meal on a slightly more subdued note. Despite this, Bergamot provided an incredible meal and experience. While the wait times between courses may have been longer than expected, they allow time for a truly enjoyable dining experience. Prepare yourself by bringing friends and companions outside of Harvard Square and enjoy a phenomenal meal. While Bergamot may appear to be a formal white tablecloth restaurant, it exudes a familiar and homely vibe. Keith Pooler, Executive Chef and Owner, has created a comfortable dining environment for those seeking a good meal and a nice conversation. * Note: the $75 7-course tasting takes 2 hours, so be prepared. The waitstaff, excited to finally have people enjoy Santouka’s new location. Saporo, a Japanese beer, was featured at the opening. View from inside the kitchen. The special guests at Monday’s private opening help Mr. Hatanaka open the barrels of saké in the traditional Japanese method. Saké, a traditional Japanese rice wine, barrels. Since word got out about the opening in early November, the hype for Santouka Ramen’s opening on campus has been palpable. Today, Santouka will finally open its doors to the public, ready to serve its steaming blue bowls of broth and noodles. Unlike the traditional fast food-style ramen shops of Japan, the Cambridge location is Santouka’s second full-service restaurant, the first having opened in Seattle last spring. Harvard Square, already a destination for those looking for a sit down meal, will surely be the perfect place for Santouka’s second restaurant endeavor. Accommodating both ramen diehards and insta-ramen makers alike, each member of Santouka’s staff has undergone an intensive, two-week training to master the nuances of Japanese culture and cater to the needs of each individual customer. While it is not the first restaurant of its kind, founder Hitoshi Hatanaka was quick to point out that Boston and Shinagawa, his hometown, share a very similar climate (i.e. bitterly cold winters). In this way, a steaming bowl of noodles, broth, and pork, will warm you right up in the way that Hatanaka had intended when he opened his first shop in 1988. Even the bowl design is taken into account: the thinner, deeper bowls are designed to conserve heat in colder climates. In addition to being a salvation from the cold, the founder explained that the dining room was designed specifically with Harvard students in mind. With two large, cafeteria sized tables at the center, Santouka will be well-suited for blocking group outings, as well as a casual date night. The prices ranges from about $10 to $15 per meal and it’s worth every penny. Once just a small, nine-seat ramen shop in the Hokkaido region of Japan, Santouka Ramen is now an international business with locations from Malaysia to California. Throughout all this sucess, Mr. Hitoshi Hatanaka seems to have maintained Santouka’s character, as well as his own. 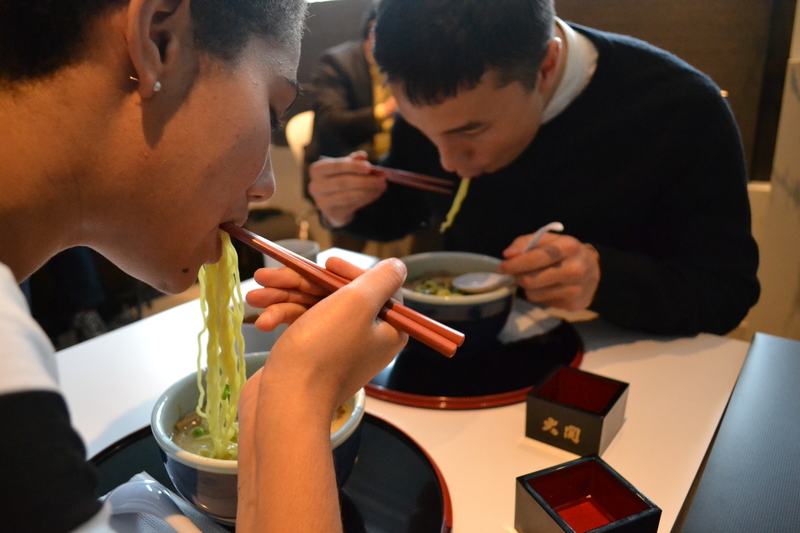 At Monday’s private opening, scenes from the hit Japanese comedy, Tampopo, which Hatanaka cites as the inspiration for the opening of his first shop, were shown to instruct the attendees in the proper way to both slurp, and cherish, their ramen. 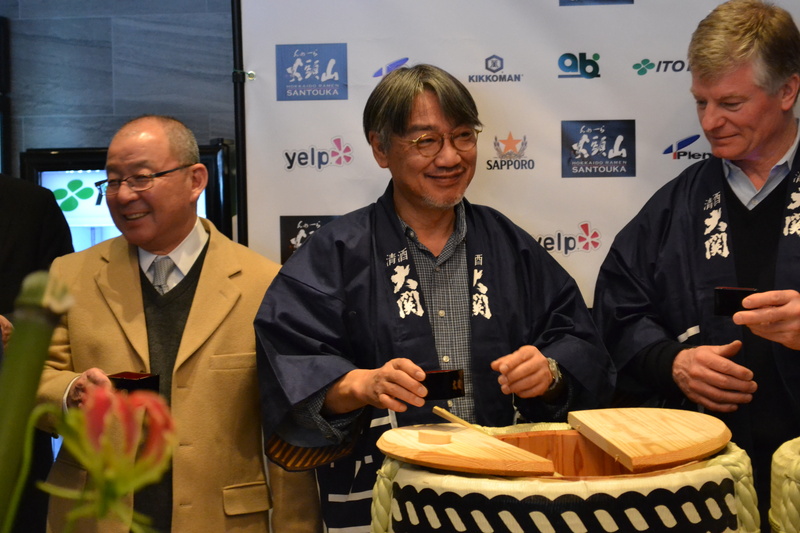 Mr. Hatanaka, pictured middle, helps serve saké to the attendees of Monday’s opening. 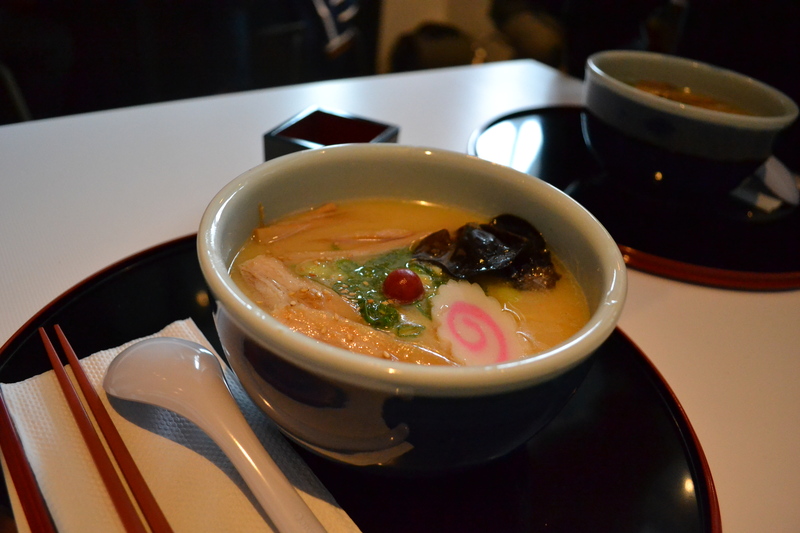 Without a doubt, you will find the best ramen in Cambridge at Santouka. Santouka has only been able to expand from its humble beginnings to an international chain by staying true to its original goal: serving high quality ramen to its customers. Lots, and lots of hungry customers. Though the noodles are not produced in house, Santouka has decided to maintain an especially keen eye on its broth, which is considered by many to be the heart of any bowl of ramen. With a good broth, noodles are just as auxiliary (or important, depending on your point of view) as the pork or mushrooms. The Tonkatsu broth base is laboriously made by simmering pork bones for twenty hours, extracting every last bit of flavor and fat from the bones and concentrating it into a rich and milky elixir. The addition of other ingredients, especially vegetables, add a sweet tinge to the creamy broth. 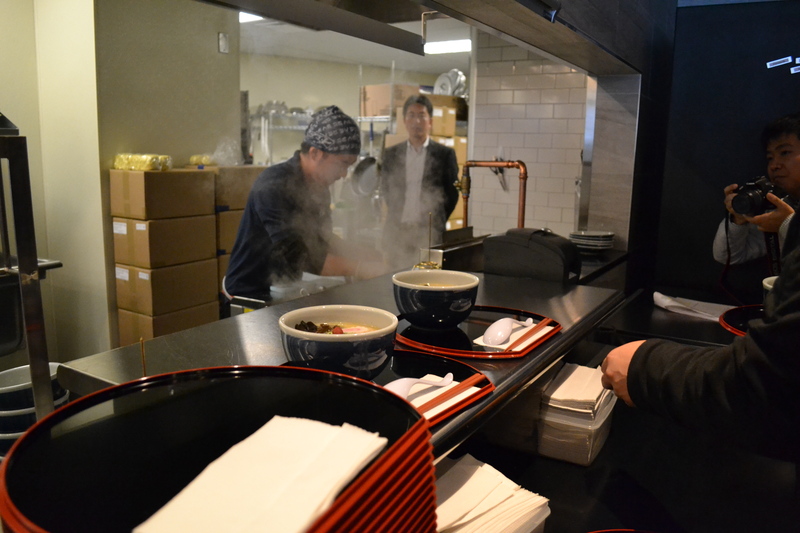 The dedication to the broth can also be seen in the amount of space the restaurant has devoted to the simmering process. As one can see from the long, rectangular window along the south wall of the restaurant, most of the kitchen is taken up by eight huge vats of broth, each clouded with the capricious steam from the pork and vegetables simmering below. The vats, lit with green light to emphasize the true alchemical magic constantly at play, can even be seen from Bow Street, enticing any passerby. Here Head Chef Igo-san stands akimbo, taking a moment of rest before jumping back on the line. A veteran team member from Santouka’s Seattle location, Igo-san is especially familiar with, as well as proud of, the quality of ingredients he gets to work with everyday at Santouka. 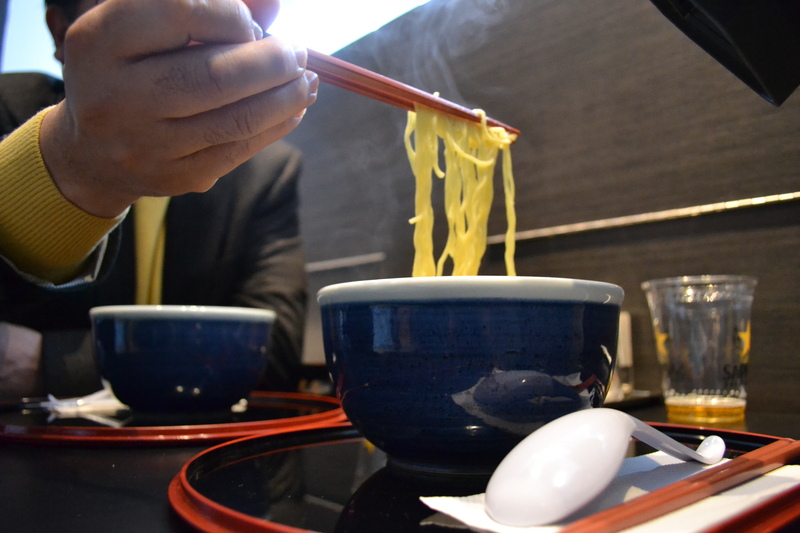 The noodles are made from a unique blend of wheat made specifically for Santouka that creates a full-bodied noodle which holds onto the broth flavor. While the more traditional ingredients, such as nori, umbroshi, and miso, are imported from Japan, the pork comes from the US to ensure freshness before it undergoes the secret process of cha shu. Tackling one of these mighty bowls can be intimidating– where does one start? The founder, being so inspired by the Japanese comedy Tampopo, introduced ramen eating technique through one of the movie’s iconic scenes in which an obsessive old man demonstrates with extreme affection how to eat ramen. (It’s definitely worth a look; check it out here). 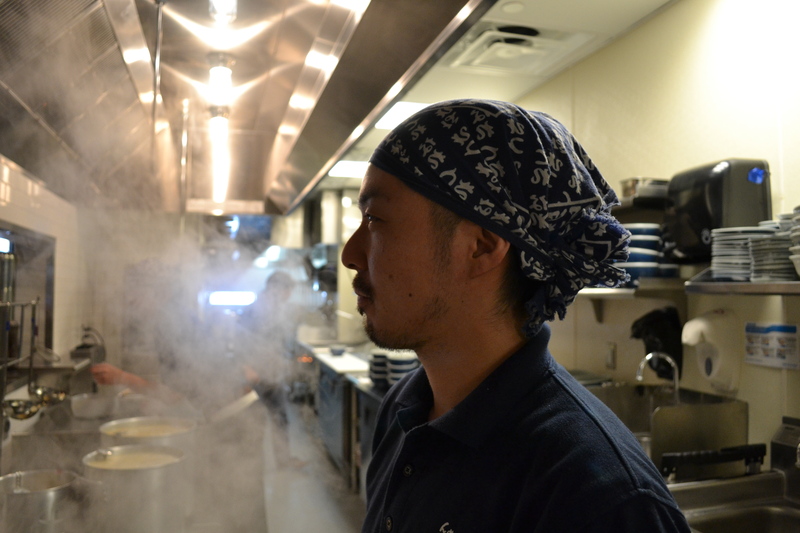 Head Chef Igo-san prepares Santouka’s signature Shio ramen. The bowl, roughly the size of an expanded stomach (foreshadowing much? ), is first placed in front of you along with the proper weapons of choice: chopsticks and a deep soup spoon. The soup is scalding hot, and the arrangement of toppings appears too beautiful to be disrupted. But be disrupted, it must! For nothing may stand against you and ramen in your face! First, you pinch off a half dozen strands of noodles, and then, being careful not to sever any indivdiual strand, start slurping them into your mouth. 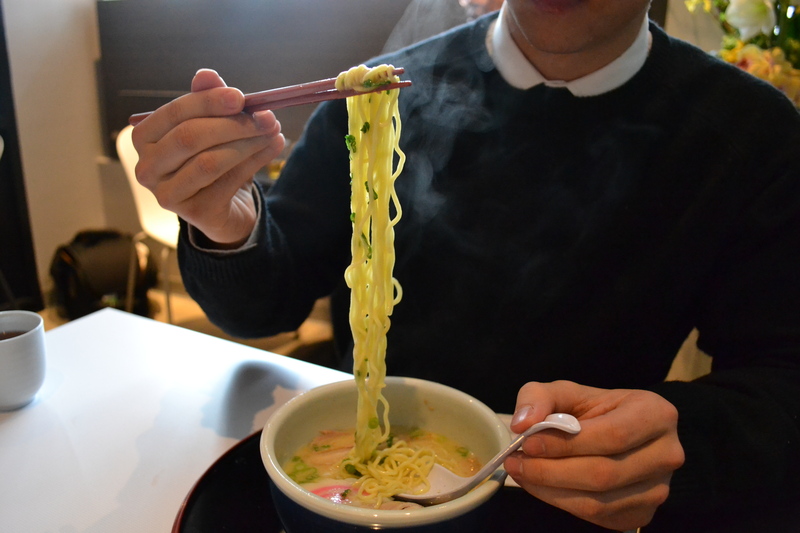 When slurping, it is important to make noise and slurp in air with the scalding noodles in order to cool them down. The noodles soak up and deliver the broth, combining the flavor of the rich opaque pork bone broth and the texture of the full, lush noodle strands. The central concept behind a good bowl of ramen is combining the variety of flavors and textures found in the soup. When the soup, noodles, and toppings are eaten in flavor-texture combination, innumerable sensations are possible. The cha shu pork (1) is “the best pork I’ve ever had” (said Dana Ferrante, self-proclaimed pork specialist). Made with the fatty underbelly of pig, the pork is unbelievably tender and bursts with the hot fat flavor before melting away in your mouth. The bamboo shoots (2), harvested as young bamboo and then steamed, offer a subtle earthy taste with a pleasant fibrous texture that stands in contrast to many of the other ingredients. The fish cake (3), a new sensation to those unfamiliar with ramen, is a loaf of pureed whitefish with a very light flavor, standing out no t only because of its decorative pink swirl, but also with its chewiness. The wood ear mushroom (4), with a flavor reminiscent of the woods, has a texture similar to the bamboo shoot, but it a bit softer and smoother. Finally, the hard plum (5): with its sweet, vinegar, pickled bite, cuts right through the fattiness of the broth and refreshes the mouth. With so many combinations of flavor and texture to try, there is a new experience in store every time you eat a bowl of ramen. One last suggestion: eat it fast. The ramen is best when it is piping hot and first brought to the table. When the soup gets cold, the broth will dehomogenize and the noodles will lose their firmness. In the words of the owner, Ramen is “happiness in a bowl.” As I took my first loud slurp of ramen and chewed, I could not prevent a smile from spreading across my face. Delicious, hot, and comfortable. The ramen made me feel, well, happy. What can bother you when you are warm and have eaten your fill? Here I am, Santouka. Signed, slurped, delivered, I’m yours.